It's no secret that the past 3 months have been somewhat of anti-knitting months (my hearts even been wondering into areas like cross stitch again, especially when I found some unopened kits). I'm not sure why. Perhaps it is because most of my knitting is done in the mornings and lately the mornings have been taken up with either being sick, or lightly napping (while keeping an eye on a 4 year old) Thus no knitting, and the things that I've tried to knit have ended up at the bottom, drowned dead of the frog pond. Stuff just wasn't working. How could I refuse. Someone asking me to knit for them? No way. Deadline Feb 10th at her house in her hands. I'm not sure when the 2nd one will be made, but it was a nice practice project. 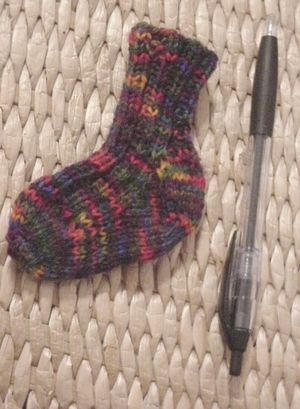 It's made with left over trekking sock yarn and is very cute. I haven't really been able to knit any baby stuff. I just can't get motivated. I have an ultrasound in a month and maybe then we will find out the gender and that will help. I don't know. I've never been one to knit baby stuff.... But at least I have one sock now lol. At first Susan wanted a triangle shawl, but she's rather tall and very skinny. This is for a military ball, and I just thought she'd look better in a Stole. Plus she's a belly dancer for her hobby and these Arab like designs just scream out to me for her. 1) Shipping was FAST. I ordered before the weekend and got it today. I think I have already fallen in love with Zephyr... I've casted on and did the first 4 rows already and it's just really nice yarn. Susan chose Pewter as her color choice which at first had me a bit worried (was thinking daub grandmother gray) but this is a really pretty almost soft silver/grey color. I'm counting that I have about 30 days to knit this. 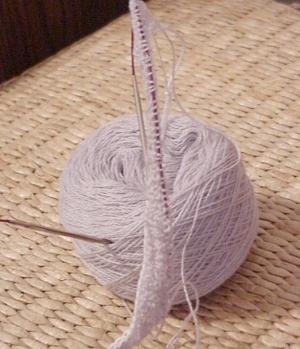 Not counting the edging that is knitted on... I think I figured I need to knit at least 20 rows a day. Looks possible. It's only over 99 stitches, knitted middle out with purl back rows. What you think? 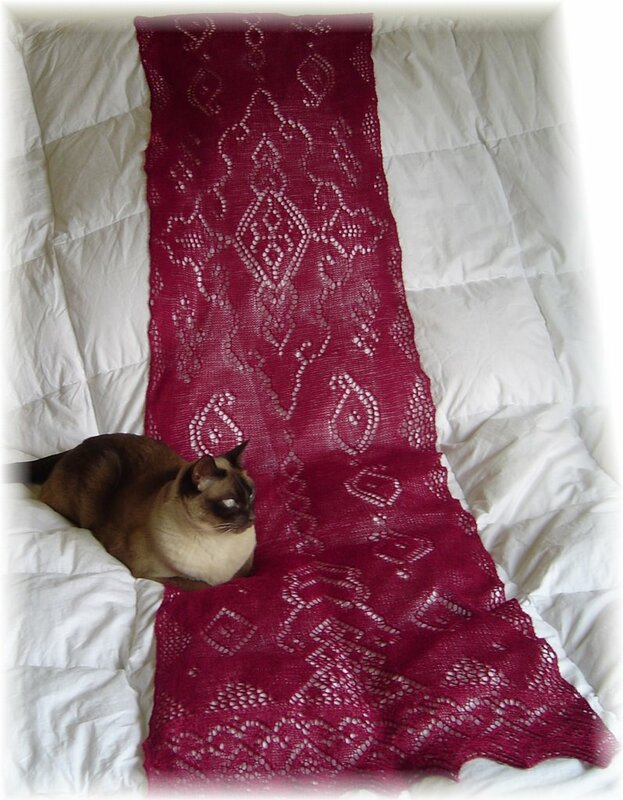 Anyone who can knit Hidcote as fast as you did can certainly do that shawl in 30 days! That's a very pretty yarn, & you are so sweet to do that for your SIL.